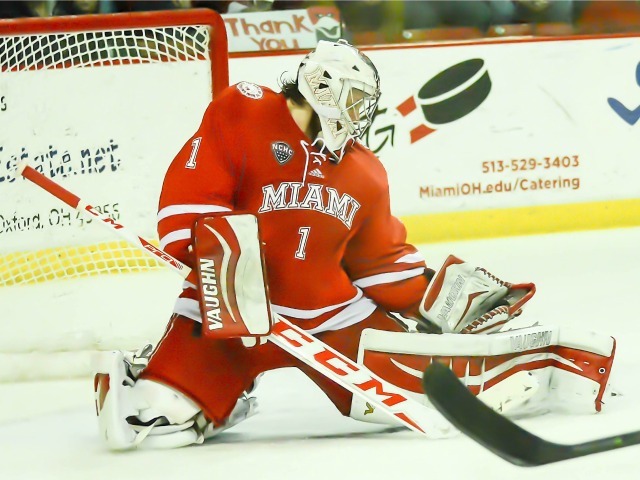 OXFORD, Ohio – Last Sunday, hopes were that Miami’s win over RPI was a momentum builder, as it scored three times in the third period for a boost heading into the heart of league play. But it was business as usual for the RedHawks, Version 2015-16 on Friday, as once again they failed to hold a late lead and ended up tying Minnesota-Duluth, 1-1 at Cady Arena. This time it was an equalizer by Tony Camenaresi with 5:38 left on a laser from the right faceoff circle. It was the sixth straight NCHC game that Miami has given away valuable league point/points in the third period. That bears repeating: In its last six conference games, the RedHawks have squandered at least one league point in the third period, many of which were lost late in the final stanza. Let’s assume for a second that Miami had six more points. The team has given away two and three points in some of these contests (Friday it was just one, as the RedHawks won the 3-on-3), but add six points to its total. That would give it a total of 16, good enough for third place in the NCHC. 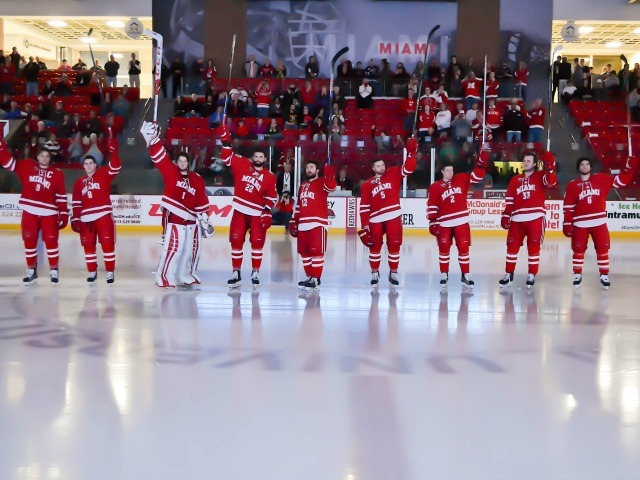 Plus instead of 6-10-3 – the RedHawks’ current record – it would be closer to 8-8-3, which would put Miami on the PairWise bubble with its brutal strength of schedule. Instead the RedHawks have 10 and are mired in seventh place. And yet, with all of the bad things that have happened to Miami this season, the team is just five points out of that No. 3 seed. The team that holds that spot? UMD. So a win on Saturday would pull the RedHawks within two of the Bulldogs. The top two seeds are off the board, as North Dakota and St. Cloud State are both 12 points ahead of the field. But home ice? Even at 2-7-2 in league play, Miami has every chance to get back into the race and earn home-ice advantage in the NCHC Tournament. And unless the team’s record improves dramatically and quickly, home ice will be critical as the RedHawks hope to make the NCAA Tournament. But none of these good things will happen for Miami if it can’t figure out how to maintain third-period leads. – The RedHawks’ power play continues to have zero to do with power. Miami is 0-for-16 in its last six games and has allowed two shorthanded goals in that span for a net of minus-2 goals on the man advantage. That’s a special kind of bad. Not coincidentally, MU has scored two goals or fewer in five of those six games. 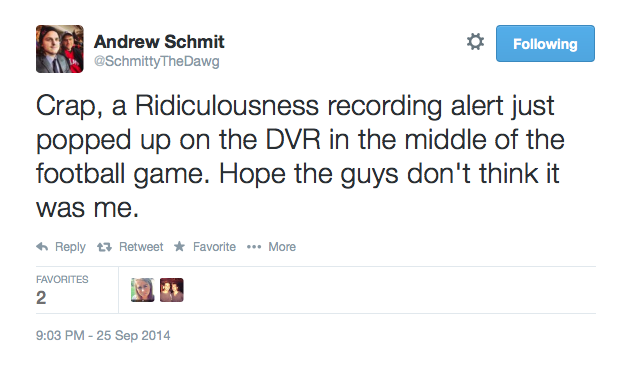 – Actually, the power play was so bad that Minn.-Duluth gained momentum on Miami’s first chance. The RedHawks were dominating early in the second period, but after doing zip on that opportunity, the Bulldogs controlled the pace the rest of that stanza and were the better team the rest of the way. Play was pretty even in the first period. – Some perspective: UMD has a good team with excellent goaltending and talented forwards. It’s head-scratching that the team is 7-7-4, especially with so many key players back from last season. This team is poised for a second-half run, making Saturday’s game even more important for both squads. – The attendance for this game was 1,743. When does this J-term end again? – Was that actual rock music we heard in the second period? No kidding: An assortment of mostly standard rock selections was played in that frame before the powers-that-be returned to the same miserable crap fans have become accustomed to hearing. Hey, at least there was no Village Idiots or Neil Diamond in this game that normally makes hockey traditionalists want to jam ice picks through their ear drums. – Per the NCHC, it looks like Miami will don its red jerseys for home games the rest of the season. Not sure what the point of changing that up is. FORWARDS: D. This corps combined for one point (assist by senior Andrew Schmit) and managed a whopping 20 shots in 65 minutes. Freshman Jack Roslovic looked either disinterested or tired late, and with few offensive weapons this team needs him to be focused at all times. The Crash Cousins line, with Ryan Siroky, played well together, with sophomore Conor Lemirande also playing a role in Miami’s lone goal. The Zach LaValle-Kiefer Sherwood duo appears to be building chemistry, and the pair of freshmen will hopefully evolve together for the next three-plus years. DEFENSEMEN: C-. Too many odd-man rushes, too many unnecessary icings. Not a typical shut-down effort from this group, although Coach Enrico Blasi did shake up the pairings as Louie Belpedio returned, which may have affected chemistry. Senior Matthew Caito took a 4-on-4 shot from the faceoff circle that whistled wide, and that’s how UMD scored its lone goal. That shot has to be on net, and he’d probably be the first to admit that, although he was his typical solid self otherwise. Grant Hutton has been a defensive staple in his freshman year but struggled in this game. He looks like a natural right D-man and was a little awkward on the left side. Chris Joyaux did score the team’s lone goal, which elevates this group out into the ‘D’ range. 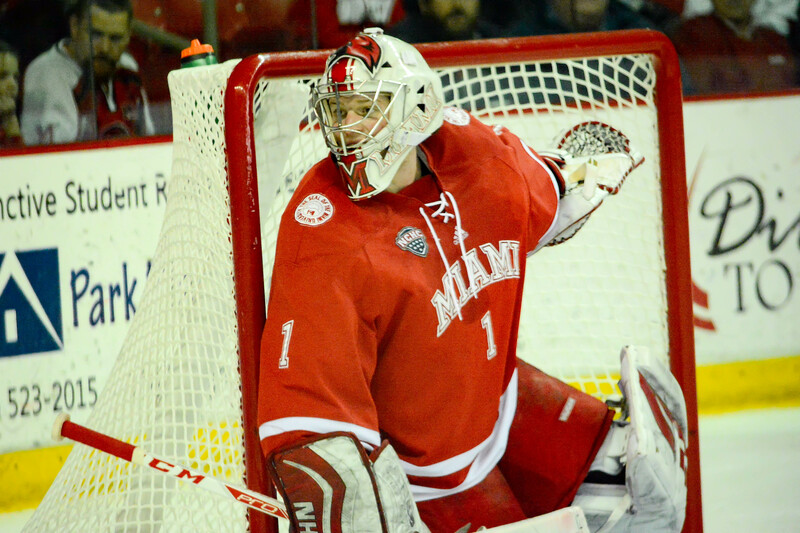 Jay Williams stopped 36 shots for Miami on Friday (photo by Cathy Lachmann). GOALTENDING: A. There’s the hockey cliché of stealing a win, but can a goalie steal a tie? Jay Williams stopped 36 shots, and it was practically a shooting gallery his way the final 25 of regulation. There wasn’t one signature save on the night, but he was strong the whole game and was excellent at controlling his rebounds. His best effort of the season by far. The one goal was an absolute rip ticketed for the corner of the net. Without Williams, this game goes in the loss column for Miami. LINEUP CHANGES: Up front it was Devin Loe out and Conor Lemirande in on Friday, perhaps because of the ultra-physical nature of UMD. 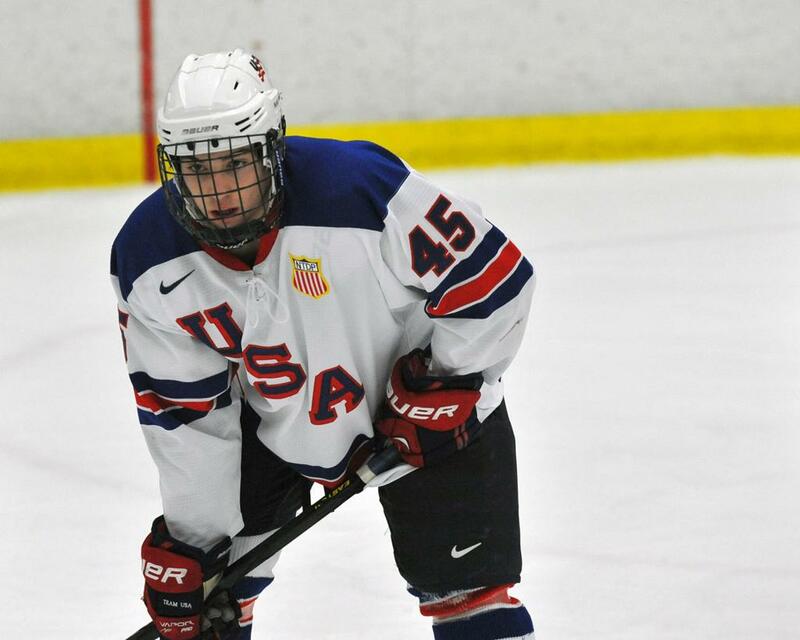 With Belpedio returning from the World Juniors, he was back on the blue line after playing in Finland this week. His presence relegated fellow defenseman Colin Sullivan to the scratch column despite his strong play last weekend. Williams was in net for the second straight game, and he certainly has earned at least a split of playing time with Ryan McKay, who will probably start on Saturday. OXFORD, Ohio – Once again, Miami couldn’t close out a win. The RedHawks managed two points in a 1-1 tie vs. Minnesota-Duluth at Cady Arena on Friday, allowing a tying third-period goal and earning the extra point in 3-on-3 play. Josh Melnick (right) and Louis Belpedio (left) celebrate Belpedio’s OT goal (photo by Cathy Lachmann). Miami has now held the lead after two periods seven times this season and has won just three of those games. 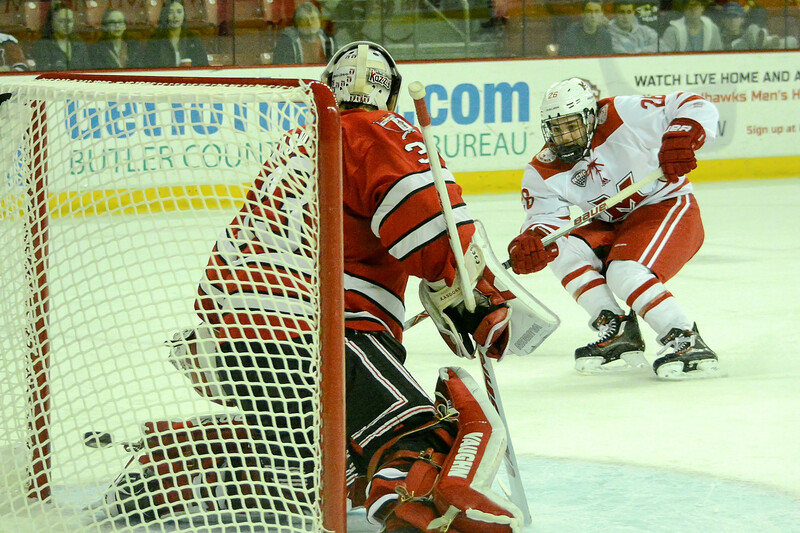 Senior goalie Jay Williams stopped 36 shots for the RedHawks, the highest save total for a Miami netminder this season. After a scoreless first period, the RedHawks took the lead when senior defenseman Chris Joyaux backhanded one through Bulldogs goalie Kasimir Kaskisuo’s pads 2:16 into the middle frame. 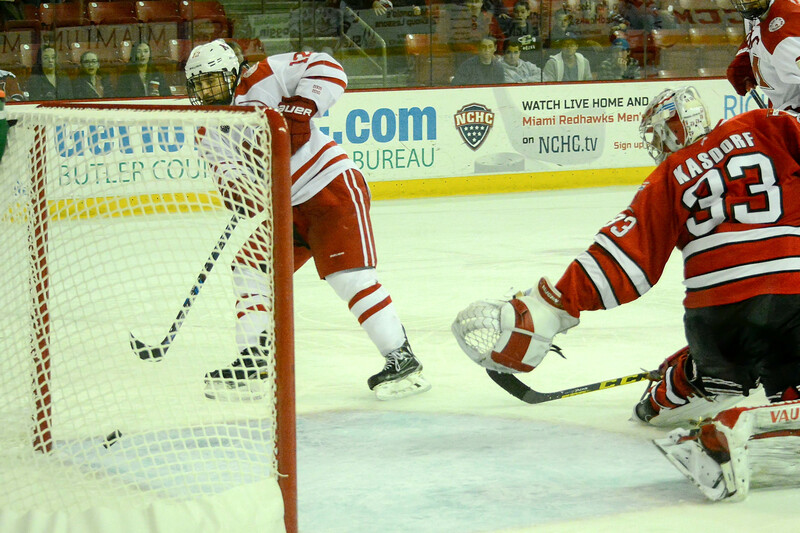 Miami held the lead until the 14:22 mark of the final frame, when Tony Cameranesi blasted a shot by Williams on a 4-on-4 to tie the score. The puck went in and out of the net so quickly that it was initially ruled no goal before replay confirmed the puck hit the inside of the cage. The game was officially recorded as a tie, and Louis Belpedio knocked the puck home in the second extra session to give the RedHawks the extra point in the conference standings. Joyaux had scored one career goal entering this season but has found the net in consecutive games and has four markers this season. Senior forward Andrew Schmit earned the lone assist, his third of the campaign. With the two points, Miami now has 10 in 11 games and remains in seventh place in the NCHC at 2-7-2. At 3-2-2 when leading after two periods, the RedHawks’ winning percentage in those scenarios is just .571.